Cartilage transfer procedures involve moving healthy cartilage from a non-weight-bearing area of the joint to a damaged area of the cartilage. 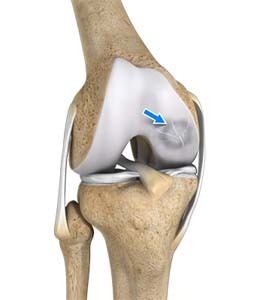 There are two types: OATS osteochondral autograft transfer system and mosaicplasty. In mosaicplasty, plugs of cartilage and bone are taken from a healthy cartilage area and moved to replace the damaged cartilage. Multiple tiny plugs are used and once embedded, resemble a mosaic pattern, hence the name. With the OATS procedure, the plugs are larger. Therefore, the surgeon only needs to move one or two plugs of healthy cartilage and bone to the damaged area. OATS is not recommended in everyone. OATS is typically used for patients aged and with focal cartilage damage, usually because of trauma, and available healthy cartilage for transfer. In the OATS procedure, the surgery usually begins with an arthroscopic examination. Arthroscopy is performed in a hospital operating room under general anesthesia. Dr. Patel makes a tiny incision over the joint and inserts an arthroscope. The arthroscope is a small fiber-optic viewing instrument made up of a tiny lens, light source and video camera to enable the surgeon to visually examine the joint. If the surgeon decides the procedure can be performed, the scope is removed and an incision is made over the joint. The surgeon prepares the damaged area of cartilage. Using a special coring tool, the surgeon makes a hole in the cartilage sized to fit the plug exactly. Dr. Patel then harvests the plug of healthy cartilage and bone from a non-weight-bearing joint. This plug is transferred to the cored hole and implanted into the prepared hole of the damaged area. Over time, a successful OATS surgery will enable the bone and cartilage to grow into the damaged area successfully, resolving the pain. A bandage will be wound around the operated joint. You will usually be able to remove this the next day but leave the steri-strips in place. These will fall off. Once you recover, your IV will be removed and you will be taught several exercises. Patel will see you prior to discharge and explain the findings of the operation and what was done during surgery. It is normal for the joint to swell after the surgery. You will be sent home with a cryocuff cold therapy unit. You may shower once the bandage is removed. Leave the steri-strips intact.